For ultimate flexibility in positioning micromanipulators or other devices adjacent to your microscope, look to the MT-75 series stands. These unique gantry systems offer adjustable vertical and horizontal axes and up to 360 degrees of rotation. Your manipulator or other device will mount to the 3/4in thick aluminum cantilever which is dovetailed for secure positioning. The cantilever assembly is mounted on a heavy 2in diameter stainless steel post. 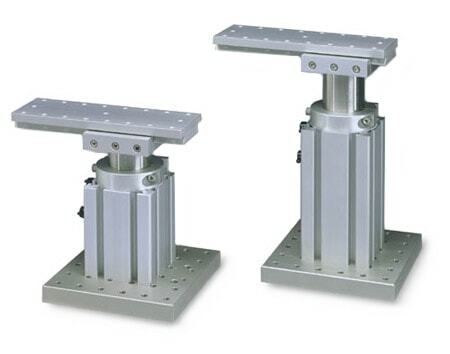 The post is supported within the same extruded aluminum tower used in our MT-70 stands. The tower can be center mounted or edge mounted to the base-plate for an additional degree of positioning freedom. Vertical positioning is achieved with an aluminum collar which securely locks onto the steel post to fix the height of the system. The MT-75 is suitable for use with most inverted microscopes, and can be adjusted from a minimum height of 8 5/8in to a maximum height of 12 1/2in. The MT-75S is suitable for most upright scopes, and can be adjusted from 6 5/8in to 9 1/2in. These systems are very stiff, deflecting approximately 2um per 25mm rise with a 1.5 kg load at the end of the cantilever. A quick lock mechanism allows easy unlocking and rotation of the post/cantilever assembly up to 320 degrees, then rotation back to the same positive stop position and locking in place (e.g., insertion and removal of microelectrodes from headstages). Remove the positive stop and you have a full 360 degree rotation. A PTFE inert washer contributes to the smooth rotation of the system. The solid aluminum baseplate has through-holes on 1in (25mm) centers for mounting onto tables. The cantilever has eighteen 1in spaced 10-32 holes along the edges.